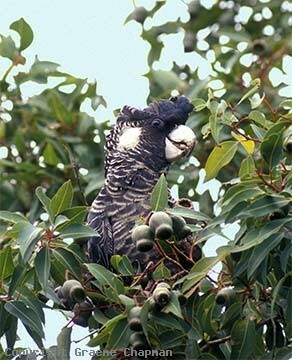 Only in recent years has Baudin's Black Cockatoo been recognised as specifically different from the superficially similar Carnaby's Black Cockatoo. 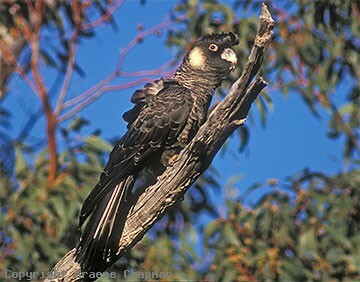 Right up until 1979 they were both known collectively as White-tailed Black Cockatoo, the close Western Australian relation of the more widespread Yellow-tailed Black Cockatoo of eastern Australia. As long ago as 1933 the astute WA ornithologist Ivan Carnaby suggested there were two sorts of White-tails, but no serious investigation was done until the 1960's. 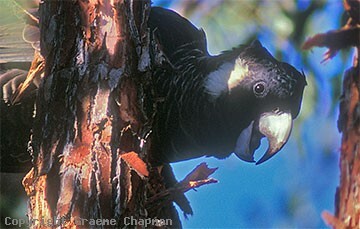 As part of a research programme into cockatoos by CSIRO's Division of Wildlife Research, Dr. Denis Saunders led a project to investigate the then "White-tailed Black Cockatoo" which was regarded as a pest in pine plantations. How the wheel has turned; now these Black Cockatoos are regarded as "under threat" and efforts are being made to enhance their survival! Intensive long-term ecological research (a rare thing in Australia these days) can reveal the innermost secrets of a subject. 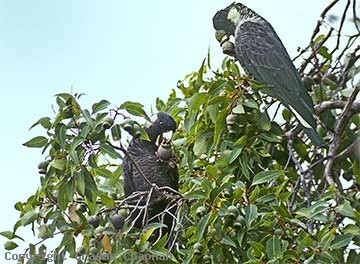 In this case, after studying them for some years, Dr. Saunders suggested that the two forms of White-tailed Black Cockatoo be separated subspecifically on the basis of both physical differences and different life histories. Basically, they lived in different places and ate different food. More recently, in 1994, a new checklist of Australian Birds was published, "The Taxonomy and Species of Birds of Australia and its Terrritories" by Christides and Boles. When compiling this publication it was considered that the differences between the two forms merited specific status, so since then they have been regarded as separate species. The differences between the two are not obvious. The longer bill of Baudin's is visible in the field (see pic#766206), but other physical differences need closer inspection. There are also slight differences in the calls - not everybody can detect these. The biggest difference is in the biology - Baudin's are essentially forest frequenting birds and feed on the fruits of eucalypts - Carnaby's are more heath-loving and feed on seeds of hard-fruited natives such as hakeas and banksias, and pine cones. 766202 ... Baudin's (Long-billed) Black Cockatoo, female. 766204 ... Baudin's (Long-billed) Black Cockatoo, male.